Do you know “what’s what” with the DIY terms upcycle vs. repurpose? I see these words used interchangeably over and over again, and often in the wrong context. So I thought I would share a quick lesson to help you distinguish your own DIY projects. Upcycle, in very simple terms, is taking something and making it better. It’s the reuse of an item that will still be used in the same way – but it looks new and improved. Upcycling can be achieved through paint, add-ons, new upholstery, etc. 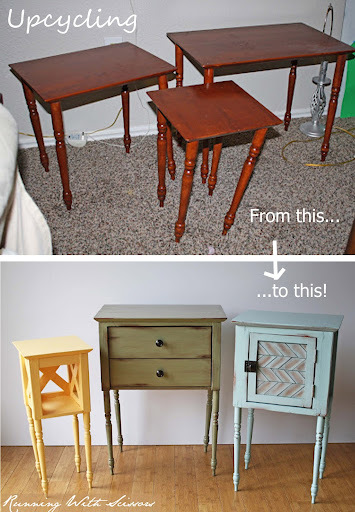 Here’s a great example with upcycled side tables from Running with Scissors (includes a tutorial). And guess what? Both of these examples are Recycled – which simply means that they aren’t ending up in a landfill somewhere on the planet. They have been given a second life and another chance to be loved again.Hope that helps! So what is your current project? Upcycled or repurposed? Thanks for this helpful distinction (for inclusion in a blog I’m currently writing) but I don’t agree that both upcycling and repurposing are ‘recycling’ Recycling I define as changing reclaimed material (glass, metal etc) into a new supply of the same material. 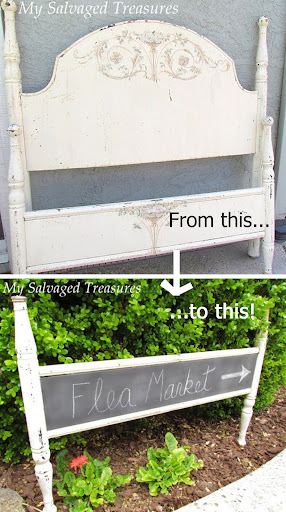 I’d describe upcycling and re-purposing as ‘re-use of reclaimed materials. But this makes the point that action around saving resources in more important that trying to define the terminology!